Much has been made about distributed ledgers and particularly Blockchain in recent years. Improved security through a higher level of encryption, increased trust through the removal of intermediaries and a faster pace of transactions are commonly cited benefits. On the downside, critics are lamenting Bitcoin’s mining monopoly and lack of regulation and compliance that surround the technology. In the financial services sector, no other disruptive technology has caused quite such a stir. Distributed ledger technology is now being used for smart contracts, proof of ownership, voting systems and other decentralized use cases. According to the World Economic Forum, 10% of global gross domestic product (GDP) will be stored on blockchain technology by 2027. Indeed, companies like Ripple and Equinix’s partner Cobalt have leveraged blockchain-derived concepts of encryption and digital signatures to reduce post-trade and transactions costs. By extension, established banks including Santander and JP Morgan have formed alliances to explore the technology’s potential. Unsurprisingly, internet giants like Google and IBM are investing heavily in this area too. But while there are already over 1,100 cryptocurrencies available today and the potential for blockchain to streamline the FS industry is estimated at as much as $6billion per year by Goldman Sachs, myths and uncertainties remain. Can it really overhaul an antiquated banking system? What role can interconnection – private data links between businesses – play in facilitating the blockchain-inspired financial services sector of the future? Blockchain technology will play center stage at the Finance Magnates London Summit this week at Old Billingsgate. 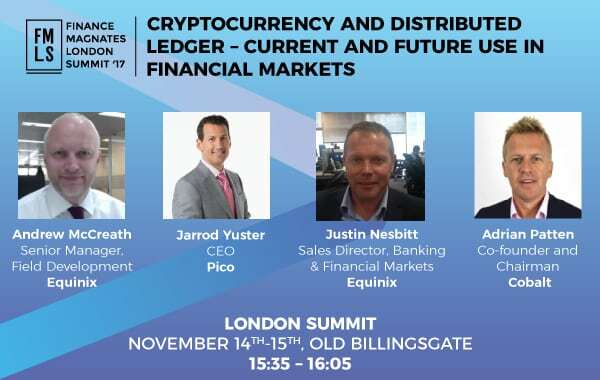 Equinix’s Andrew McCreath and Justin Nesbitt will be featured in the cryptocurrency and distributed ledger technology panel on November 15. Each day trillions of pounds are being moved through the global financial system and it’s no secret that many of those transactions are not being delivered in the most efficient way possible. Plagued by security and agility issues, the ageing banking system is struggling to keep up with the demands of a rapidly changing world. Hence, Blockchain’s rise to prominence following the global economic crisis has seemed like the miraculous cure to a long-standing malaise. Designed to operate differently from other currency systems, Blockchain bypasses government control and requires no centralised banking system. Blockchain technology is based on heavy-duty encryption and is immutable. Whenever a transaction is added to a ledger, it is verified, cleared and stored in a block tying it to the preceding transaction, creating a chain in the process that subsequently is then encrypted again. This generates automatic time stamping, enabling evidence to be traced across multiple blockchain nodes. Due to its decentralised nature, payment intermediaries become obsolete and unknown counterparties can independently execute and verify the information on a ledger. Given the fact that the financial services industry is especially prone to economic fraud, embedding trust by proxy is a highly attractive proposition. Blockchain is a perfect fit for those looking to expedite payments. It has the potential to speed up processes and interactions between organisations, and reduce the settlement time for completing global transactions. 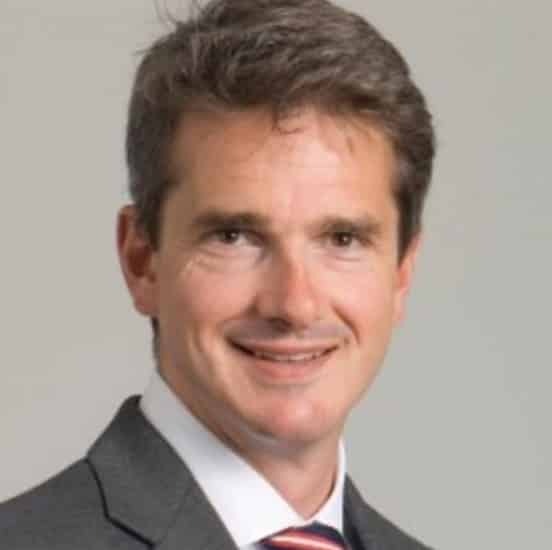 Digital wallet transactions, such as those happening via Blockchain, require direct and secure data links between organisations – what is now being called Interconnection. On the surface, Interconnection can simply be defined as a piece of fiber running from one company’s network to another’s. What interconnection allows enterprises to achieve, however, is a fundamental shift from keeping IT at the core for control to pushing IT to the edge for engagement. What makes it so useful, and thus so powerful, is that it’s a completely secure, high-bandwidth connection with zero latency. An Interconnection Oriented Architecture ultimately increases the proximity to all players and elements needed to perform digital wallet transactions – maximizing their ability to leverage performance, scalability and security during critical data exchanges, such as via blockchain. The Global Interconnection Index the financial services industry is set to experience the highest demand for Interconnection Bandwidth capacity by 2020 – and the rapidly expanding network of blockchain nodes and emerging cryptocurrencies is predicted to be a key driver. As with any radically new technologies, Blockchain does not come risk-free: the emergence of private distributed ledger grants system operators control over verification processes and the lack of regulation hinders accountability, and the often-hailed inclusivity benefit has seen black market trading skyrocket. Considering this, can Blockchain indeed have the power to transform the financial system as we know it? There’s no doubt that Blockchain will stay front and centre of discussions among established institutions and disruptors alike. Some will continue to explore its potential; others will avoid it for as long as possible, and the rest will take more time to decide where they stand. The most probable outcome in the next few years is that consortium-only private blockchains will become increasingly common. Based on a central function to ensure compliance, we can anticipate a fast-growing number of consortium ecosystems springing up across the industry. Whereas such a scenario may be considered more evolutionary than revolutionary, let’s not forget that it took more than thirty years for TCP/IP to spark a paradigm shift. It’s certainly not time for organisations to stop their blockchain pilots just yet. How about before we think going digital around the globe we look at cyber crimes statistics in the U.S alone? I am pretty sure it’s a very long way before this could be done, maybe as long as it would take NASA to step on the sun. With an increase in Number of organizations globally.Blockchain interconnections has a key role to play in providing the Scalability,Security and Speed needed for all Parties to collaborate. We will be living in a Cashless World very soon.